The Indian scooter market is maturing and continues to grow robustly with automobile companies expanding their product portfolio to lure buyers in Asia’s third biggest economy. Undoubtedly, scooterisation has taken a firm grip in India and the segment is firing on all cylinders. The scooter segment is growing faster than the traditional motorcycle segment in the country with more women and men buying scooters rather than motorcycles. In January, 5,53,695 scooters were sold across the country, clocking handsome year-on-year growth of 48.29 per cent. This number also constituted 33 per cent of the total two-wheelers sold in January, which means that one of every three two-wheelers sold is a scooter. And significantly that pace of growth is only increasing day by day. Honda Motorcycle & Scooter India, the biggest scooter maker by sales in the country, is making the most of it with its Activa family brand. The Activa scooter remains the undisputable king of the scooter segment in the country. Now the company has further strengthened the Activa brand range with a host of aesthetic and feature upgrades on the Activa 5G, introduced at the just concluded Delhi Auto Expo 2018. Honda Motorcycle & Scooter India has maintained its pole position at the helm of the scooter market, with three of its models contributing to over 55 per cent of the total scooter sales in January. The Activa range continues to bring in huge volumes with total sales of 2,43,826 units, growing 23.77 per cent (January 2017: 196,996). The Honda Activa is the best seller among scooters in the country, retaining first rank among the top ten scooters in January. The new Activa 5G is expected to provide more sales acceleration. The Activa 5G gets LED DRLs upfront, along with a new digital-analogue speedometer along with a new colour palette to give a rejuvenated look to the segment best seller. TVS Motor’s Jupiter scooter, which sold 64,990 units, clocked a robust growth of 25.29 per cent in January, up from 51,868 units in the same month last year. The TVS Jupiter is number two at the pecking order. While the Jupiter makes for a strong case for itself in the 110cc segment, TVS Motor has introduced its first new 125cc scooter called TVS NTorq 125. Priced rather aggressively at Rs 58,750 at Delhi showroom, it is India’s first connected scooter and the most powerful and technologically-equipped scooter from TVS Motor Company yet. It rivals the likes of Honda Activa 125, Suzuki Access a125 and the upcoming Aprilia 125 in the country. With this new scooter, TVS has introduced the SmartXConnect, a Bluetooth-enabled connected technology system that comes with a mobile app. The new scooter is targeted towards what TVS calls the Generation Z, essentially the younger riders in the age group of 18-24 across the country. The modern-looking new TVS NTorq 125 scooter seems to have the potential to stir things up in the evolving 125cc scooter segment in the country. Between April-January 2018, the company has cumulatively sold 909,746 units and has seen its market share increase from 14.52 per cent to 16.13 per cent in the scooter segment. “The scooter segment is growing rapidly and their share in the overall two-wheeler market is likely to touch 40 per cent over the next three years,” Aniruddha Haldar, vice president (marketing) commuter motorcycles, scooters & corporate brand at TVS Motor Company told Financial Chronicle. “Apart from rising number of women, even men are turning towards scooters rather than buying motorcycles more because of convenience and comfort,” he pointed out. At number third spot in January is the Honda Dio, another 110cc scooter from the Japanese manufacturer, which sold 39,397 units in January, garnering 81 per cent growth (January 2017: 21,763). Hero MotoCorp’s 110cc Maestro was placed fourth in the top 10 tally in January, with the scooter selling a total of 38,338 units and doubling its growth on a year-on-year basis. It has sold only 18,563 units in January 2017. Suzuki’s Access 125cc scooter is the fifth largest seller with sales of 37,783 units, growing by 40.54 per cent, which is a significant number for the model. This model has created its image of being one of the most reliable and trusted products in the country. The Honda Grazia, another 125cc offering from HMSI stable, which was launched in November 2017, has not taken much time to make its way into the top 10 list in January. This scooter is positioned as a premium, feature-rich product, and it is known for its overall styling and comfort. The Grazia sold 22,656 units in January to rank No 6 and has cumulatively sold over 50,000 units since launch. Hero MotoCorp’s 110cc Pleasure and Duet closed in at No 7 and 8 positions, with sales of 19,463 and 18,261 units respectively. The Japanese rival brand Yamaha Motor’s Fascino scooter grabbed the No 9 spot, selling 14,123 units and the Yamaha Ray the tenth spot in the January ranking, which sold 12,918 units, especially among the college students. “With favourable demand drivers in place and low base of previous fiscal, ICRA expects the domestic sales growth to be in double-digits during FY2018 over the previous fiscal,” Subrata Ray, auto analyst and senior group vice president at ICRA told Financial Chronicle. The domestic two-wheeler volumes would derive support from demand in both rural and urban households, he said. The improved farm sentiments following two cycles of good crop, increased budgetary allocations towards rural development as well as irrigation, increase in MSPs, farm loan waivers by select states would be the drivers of rural demand, Ray pointed out. Significantly, the lasted data from Society of Indian Automobile Manufacturers or Siam, the apex trade lobby, showed that total sales of scooters during the 10-month period between April-January 2018 stood at 5,641,243 units, growing 21 per cent. During the same time, motorcycles increased only by 12 per cent. In January, scooters contributed 32.87 per cent to the overall two-wheeler sales in the country, which stood at 1,684,066 units and the trend showed its momentum to continue in the Indian market. In order to cash in on the robust growth of the scooter market, companies have also introduced new models to lure discerning buyers. Today scooter buyers want more than fuel efficiency and mileage from their scooters. They want sleek, powerful, tech-enabled speed machines and manufacturing have smelled a booming business opportunity. Over the past few weeks companies such as TVS Motor, HeroMotoCorp, and Piaggio have launched their first 125cc scooters to garner market share. HeroMotoCorp made its debut with Maestro Edge 125 and Duet 125, Piaggio has the Aprilia SR 125 and TVS launched the NTorq 125 in the Indian market. 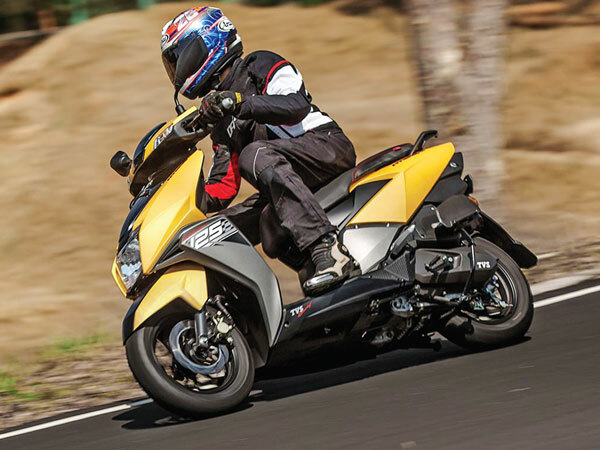 Even Suzuki Motorcycles, an old hand in the 125 cc segment, has strengthened its product portfolio with Burgman Sreet, a premium offering. At present Honda Motorcycles continues to be the biggest scooter maker by sales, with a market share of about 57.3 per cent during the first 10 months of FY2018. The second largest is the TVS Motor with 16.1 per cent and Hero MotoCorp 13 per cent market share. While the 110 cc scooters dominate the market, the 125 cc segment at present constitutes nearly 10 per cent of the total scooter sales in the country. This will dramatically rise in the coming year with the foray of 125 cc scooters in the market, say analysts and industry honchos. “We expect the new TVS NTorq 125, a sporty, stylish, high performance and a technology loaded scooter to drive volumes,” Haldar said.